New Zealand enjoyed considerable Australian footballing success in 2005. Besides winning the International Cup, the Pacific nation was invited to compete in the Australian Country Championships and thousands of junior participants were exposed to the sport. This February, Auckland hosts New Zealand's premier domestic football tournament - the National Provincial Championships - which will determine the nation's best senior league and will include junior participants for the first time. Australian football is well-established in four of New Zealand's most-populous sporting regions, all of which will compete at the Championships. Representing New Zealand's largest city, the powerful Auckland side will be seeking to defend the NPC title that they won in Christchurch during September 2004. Nipping at Auckland's heels will be their North Island neighbours Wellington and Waikato, and the South Island-based Canterbury team. 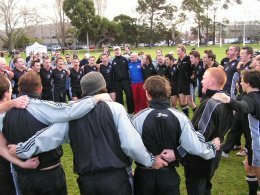 From an outsider's perspective, NZAFL seems to have strengthened their development pathways considerably in recent years, culminating in their 2005 International Cup win. However, NZAFL General Manager Rob Malone stresses that the NPC is more important in marketing Australian football in New Zealand than as a talent-identification exercise. "The National Championships have been important because they reinforce and display in a single event what the four leagues and Development Officers have developed and have created awareness of through our school and community competitions," Malone says. "Technically, players aren't really identified at the tournament, but it allows us to view them in a two-day, intense carnival against the best players in the country. "The other exciting component of the tournament is that it enables our best junior players (17- and 18-year-olds) to play against the very competent Australian players in New Zealand who, by mere fact that they have played the AFL game all their lives, are very proficient. "It's a good mixture as the NZAFL, through liaising with the Provincial coaches, try to ensure that a number of the younger talented players feature in each team." One of the aims of competitors in the NPC will be winning selection for the New Zealand team competing in the Australian Country Championships, to be held on Queensland's Gold Coast in July. Different eligibility rules from the International Cup mean that the New Zealanders can field Australian citizens in their side - provided that they have resided in New Zealand for two years. However, Malone stresses that the side competing on the Gold Coast will not look radically different from that which triumphed in the International Cup. "It will probably only change the team's composition slightly, for two reasons," says Malone. "One is that the ratio of Australian players to New Zealand-born players in our leagues has changed dramatically. In the past, the ratio has been 70% Aussie expats to 30% Kiwi-born players. This ratio is now more like 40% Aussies to 60% Kiwis, which is encouraging. "The second reason is that a number of Kiwi-born players have been playing and learning the game for a few years now and, on the back of having outstanding physical capabilities, they have developed very good AFL skills. In saying that, if the team to compete at the Country Championships has say 6-7 Australian players, then obviously the team will have better balance and more experienced hard bodied players - an essential ingredient for high level country football." One of the most exciting inclusions in the 2006 NPC program is the inaugural scheduling of an under-16s junior competition. Though thousands of juniors have participated in NZAFL programs over recent years, progress has been slow in attracting them to Australian football beyond the schoolyard. Auckland and Wellington will compete in the juniors NPC during 2006, with a view to including Waikato and Canterbury in future Championships. For participating juniors, it will be an opportunity to show display their talents in front of selectors for the Barassi International Youth Tournament to be held in Canberra later this year. Asked about the future direction of the Championships, and the possible inclusion of other New Zealand sporting regions, Malone was frank. The 2007 NPC will remain a four-side affair at senior and junior levels, with the possibility of a National Club Championship being instigated down the track to cater for less-populous regions that would struggle to compete against the strong NPC sides. "The idea of introducing an additional region is quite difficult," Malone believes. "A number of regions throughout NZ have the capabilities of producing a group of 20 guys who want to play regular Australian football, however due to geographical distances these regions aren't able to compete in the existing leagues. "This has lead me to the concept of a National Club Competition which will enable a team from say Hawks Bay to play a team from Rotorua and, in turn, one of the existing teams in Hamilton (Waikato). This concept is being discussed currently. "There is no doubt that for AFL to really move in NZ, the Club Competition is the way to go. It obviously needs to be planned carefully and be resourced accordingly (travel expenses etc). The format will allow growth and an expanded, nation-wide competition linked to our work in schools." The National Provincial Championships will be staged at Mountford Park, Manurewa, over the weekend of the 11th & 12th of February. For further details, visit the NZAFL website.